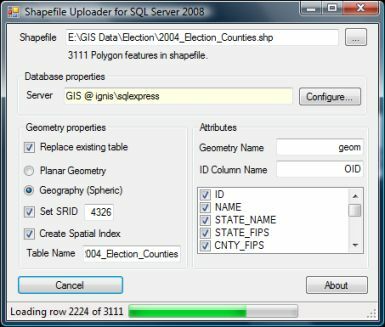 Shape2SQL : Uploads ESRI Shapefiles to Microsoft SQL Server Spatial. 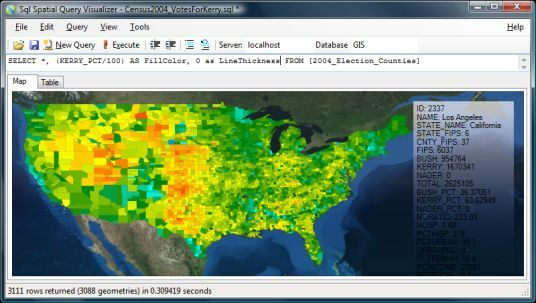 SqlSpatial Query Tool : Queries MSSQL Server 2008 and displays geometry output on a WPF-based interactive map. Either "SQL Server 2008" or "Microsoft SQL Server System CLR Types" installed on the client machine. Lastly the source code is NOT available, so please don't ask for it, and the assemblies included are not to be used with any other application than the ones coming with this download. ESRI MapIt. Dataloader + REST-based dataservice and client API's for visualisation from the world leader in GIS. Safe FME. The swiss army knife of spatial data conversions.